The news had been expected after the Cobblers' new owner Kelvin Thomas paid HM Revenue & Customs unpaid tax it was due when he bought the club last week. "This is a very positive step as we move forward," said Thomas. "We can now focus on our review of the club and developing the future plans." On Friday, the Cobblers' administration petition brought by Northampton Borough Council was adjourned to 11 December for a deal to be made between Thomas and the council. Thomas purchased the club from David Cardoza on Thursday and became executive chairman of the Cobblers. Thomas and the council have a memorandum of understanding in place over a £10.25m loan to the club for redevelopment work at Sixfields Stadium, which would would see the debt wiped out, with the council acquiring land near Sixfields for development in return. 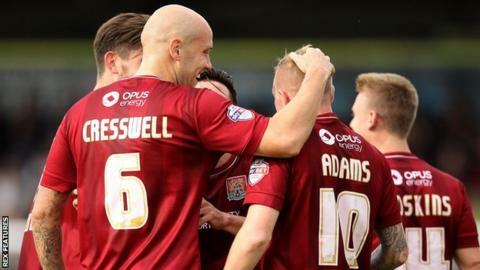 Despite the uncertainty off the pitch, the Cobblers are currently in the League Two automatic promotion places.